The Saudi Air Force has unleashed a massive attack across the Sana’a Governorate over the last 48 hours, reports Middle East-based Al Masdar News citing Yemeni sources on the ground. This appears to be the Saudi response to the U.S. call for a ceasefire "in the next 30 days" announced by Secretary of Defense Jim Mattis and Secretary of State Mike Pompeo a mere two days ago. According to the reports from Sana'a, the Saudi Air Force heavily bombarded the capital city and its surroundings, hitting a number of sites that allegedly have a Houthi presence. The string of airstrikes also hit civilian neighborhoods, including the area around Sana'a International Airport — all resulting in an unknown number of casualties. Given the timing it appears the Saudis are ready to unleash as many bombs as possible ahead of a potential US negotiated ceasefire suggested by Pompeo and Mattis; or alternately it could be the Saudis are now quickly escalating the war further to ensure a ceasefire cannot be obtained. This comes as the Trump administration has released early details of a UN-brokered peace plan aimed at ending the war in Yemen, beginning with a ceasefire within a month along with talks to be held in Sweden. Friday’s assault comes two days after the United States called for a cease-fire and negotiations within 30 days to end the war. The fresh offensive could be designed to pressure the Houthis to come to the negotiating table, which the rebels have so far avoided. 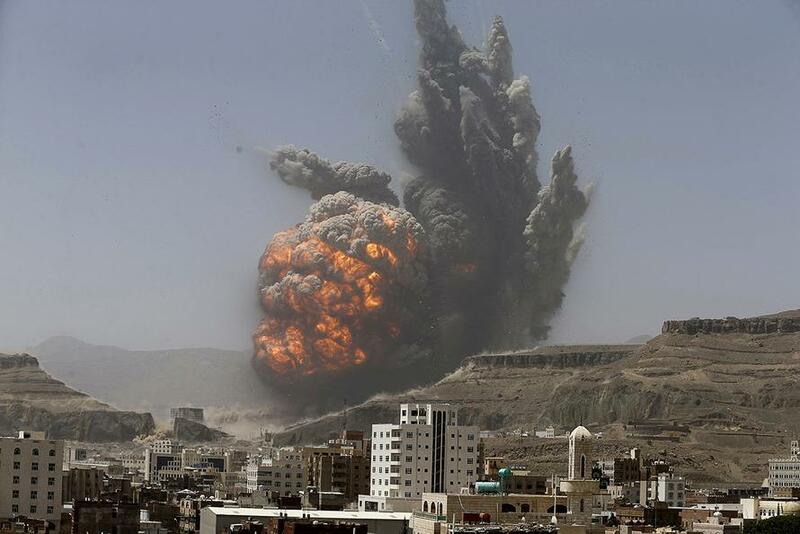 Yemeni journalist Mohammed al-Qadhi described the significant uptick in fighing in a tweet Friday morning: “Fierce battles between forces backed by Saudi-led coalition and the Houthis have been going on for hours in the southern and eastern outlets of the Red Sea port city of Hodiedah, with huge blasts being heard and airstrikes,” he wrote. This comes after both Mattis and Pompeo early this week for the first time called for a ceasefire to a war that the U.S. has had direct participation in as a key leader of the Saudi coalition, along with the UAE. Thirty days from now we want to see everybody around a peace table based on a ceasefire, based on a pullback from the border and then based on ceasing dropping of bombs that will permit the (UN) special envoy, Martin Griffiths — he's very good, he knows what he's doing — to get them together in Sweden and end this war. Pompeo followed by issuing a similar statement, saying, "The United States calls on all parties to support UN Special Envoy Martin Griffiths in finding a peaceful solution to the conflict in Yemen." The US defence secretary, James Mattis, told an audience in Washington that Saudi Arabia and its Emirati allies were ready for a deal and that the talks between the Saudi-led coalition and the Houthi rebels were being arranged by the United Nations special envoy, Martin Griffiths. When asked on Tuesday at a Pentagon press conference whether the Saudi murder of journalist Jamal Khashoggi had anything to do with the new, unprecedented U.S. call for a ceasefire in Yemen, Secretary of Defense Mattis answered, “I’d separate it out from the Yemen situation. We will get to the bottom of it.” And yet it comes just as Washington and Riyadh's relationship is under strain as international media scrutiny grows in the aftermath of the journalist's October 2nd gruesome killing. More pressure has also been put on Washington and Riyadh as the appalling extent of the humanitarian crisis in Yemen becomes clearer — or we should say that after Khashoggi's killing the mainstream media actually decided to start looking into the clear war crimes committed there. Meanwhile the Washington Post reports further the United Nations this month declared that as many as 14 million Yemenis — nearly half the population — are on the brink of famine. And another 3 million find themselves internally displaced while the bombs continue to fall.